Summary: The House of Representatives recently passed the MOBILE ACT of 2017. What is it and what does it mean for your bank? You may not know it, but the current world record holder for the fastest mile in the world for men is Hicham El Guerrouj at 3:43.13 and for women it is Svetlana Masterkova at 4:12.56. 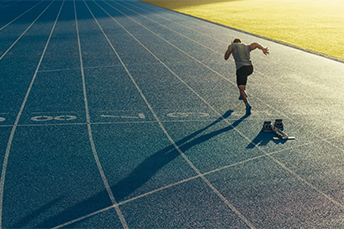 Now, most community bankers probably don't race around their bank that fast, but if you are trying to set a personal best and have some track blood in your veins, you know the times to beat. Standards in track are important but standards in banking are even more important to community bankers. That's why so many are interested in legislation passed recently by the House of Representatives known as the Making Online Banking Initiation Legal and Easy (MOBILE) Act of 2017. It creates a national standard that would allow financial institutions to scan and electronically store information from an individual's personal ID. That would make it easier and faster to open online accounts. In passing such a bill, members of the House are hoping to remove any barriers that could potentially discourage consumers from using banks due to the complexity of opening accounts. Although the Senate still needs to pass the bill, no stumbling blocks are expected there either. This means that the playing field with fintechs is being leveled for banks. Simply standardizing identity verification practices means bank customers would no longer need to physically visit a branch to open accounts. It would also make online banking more accessible for people who live in remote areas. Standardization would not only make it quicker and easier to open bank accounts electronically, but it would also help protect customers by protecting them under a bank's fraud and identity theft policies. To address privacy concerns, the identification scanned must be deleted from the bank's system once it is verified. This way, the risk of any information breach is mitigated for both the customer and the bank. The driving force behind MOBILE was to help unbanked or underbanked in more remote or rural areas. This would allow these almost 67mm people better access to financial services, as many of them have mobile phones but are miles from any branch. Even if this is not necessarily a target group for your bank, it allows you to cast your net a little wider perhaps. Although this practice was commonplace in some states already, the new bill ensures banks in all states will be able to defer to a federal standard. Passage of the MOBILE Act seems inevitable and it should give community banks a way to standardize online account opening. In so doing, we wonder how many branches could be closed in the future, as this task is usually the top one branch staff performs, according to surveys. This change is a welcome one to be sure, but it will also likely be challenging as community bankers seek to implement it across the organization. Keep your eyes and ears open for Senate passage and eventual Presidential signature, and we will let you know when those happen in this publication too. Acting Director Mulvaney has asked Congress to change the agency and fund his agency through the appropriations process, require legislative approval of major rules, subject the director to presidential authority, and create an independent inspector general. In Feb 2018, Mulvaney consolidated the Office of Fair Lending and Equal Opportunity into the office of the director. As reported in the Wall Street Journal, Novantas research finds regional and community banks captured 48% of new checking accounts last year vs. 45% for the three largest US banks (JPMorgan, Bank of America and Wells). Of note, however, is that regional and community banks had 76% of branches vs. only 24% for the largest banks. 1) Renasant Bank ($9.8B, MS) will acquire The Brand Banking Co ($2.4B, GA) for $453mm in cash (5%) and stock (95%) or 2.24x tangible book. 2) Viking Bank ($177mm, MN) will acquire First State Bank of Ashby ($37mm, MN) for an undisclosed sum. The Treasury has asked bank regulators to update and modify the Community Reinvestment Act (CRA) passed in 1977 to better reflect changes in the industry since it was passed. Treasury suggested 40 possible changes to consider including such things as: broadening assessment areas, focusing less on branches, giving credit for activity occurring through online channels, move away from subjective analysis of compliance to more statistical standards and other items. Goldman Sachs said it sees little evidence of a recession occurring anytime soon.